Deana and I finally found some Maritime Ringlets on Sunday. This is a rare species only found in the salt marshes of the Bay of Chaleur, on both the New Brunswick side and the Quebec side. Nowhere else in the world. It is considered an endangered species. We saw at least 6 individuals. 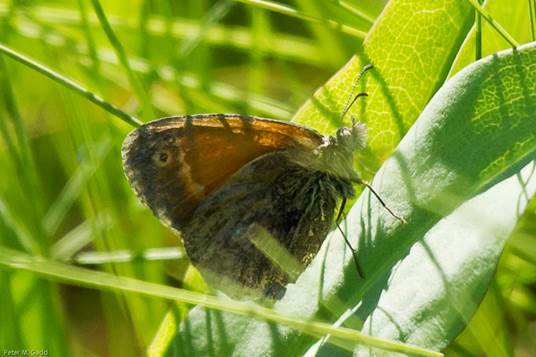 They are very similar to Common Ringlets, differing slightly in colour but mostly in habitat and flying times. They could be seen from the road-side of Queen Elizabeth Drive right at the boundary between Beresford and Bathurst. 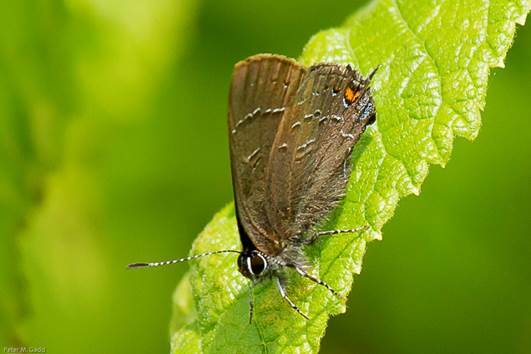 Yesterday I was in Fredericton and went to a spot that I had heard about where the Banded Hairstreak could be found. It is on the Trans-Canada Trail below the agricultural station in Lincoln. I saw three on and about a Butternut tree, their larval food plant. They are common from Quebec to Saskatchewan but seen on a limited basis in southern NB and NS. Forty-nine species of butterfly for me this season! Deana has seen very many too. Going for 50! There are 4 species which were abundant last year that have not really shown up this year. They are migrants from the Southern US and Mexico, Monarchs, Painted Lady, American Lady and Red Admiral. They would be considered a rare sighting this year. This apparently happens from time to time. I am quite certain I saw a Red Admiral at the Miramichi Marsh 2 weeks ago, but couldn’t get a photo.